Used too much or at the wrong time, flourishes can get in the way of what you want the audience to see and remember. Flourishes, by their nature, draw attention to themselves. The danger is that a flourish at the wrong moment may draw attention away from a key element the audience should be absorbing. This risk is greatest when performing flourishes within an effect rather than between effects. I remember some time ago seeing a card magic video by a European magician. He incorporated so many flourishy handlings into his magic that I literally could not follow the plots of the various effects. The constant visual noise from the non-stop barrage of flourishes was too distracting. This doesn't mean that flourishes have no place within magic effects, only that you have to know when to refrain so the audience can concentrate on more important matters. In any effect, up until the moment the magic happens, the audience should feel confident that they know exactly what is happening. You don't want to do anything to make them question whether the situation is what its supposed to be. Unfortunately, a flourish during the expository phase of an effect can sometimes do just that. There is all the difference in the world between performing an elaborate flourish cut to produce a selected card at the end of an effect and performing an elaborate flourish cut to lose a selected card at the beginning of an effect. If you want to convince the audience that that the selected card is lost in the deck, the most uncluttered handling is best. If, instead, you lose the card by means of a dazzling series of spinning multiple-packet cuts, the audience will only be convinced that they have no idea what just happened. 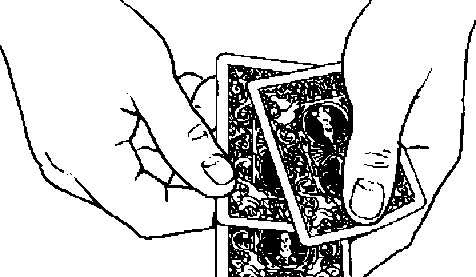 A similar situation arises if you want to give the deck a false cut to reassure the audience that the cards are randomly mixed. The simpler the false cut the better. You want to deceive people into thinking that they followed what just happened. Between effects, a display of flourish cuts can provide an entertaining interlude. If, however, your goal is to make the audience believe that you've legitimately mixed the cards by cutting them, you should do something they think they can follow rather than something they know they cannot. In his book Parallel Thinking, Edward de Bono talks about what he calls the salt curve concept. If you don't add enough salt to your food, it will taste lousy. If you add too much salt to your food, it will taste lousy. The key to good cooking is to add just the right amount of each ingredient. De Bono suggests, I think correctly, that Americans have trouble with this concept (at least, outside the realm of cooking). The tendency is to believe that more is always better. I think this stems from the sports mentality (and more generally, competitive mentality) of Americans. There is no such thing as running a race too fast, lilting too heavy a barbell, jumping too high in basketball, or throwing a shot put too far. In sports, more is always better. Of course, magic is not a sport. It's a craft; some even argue that it's an art. In craft, art, or any held with an aesthetic component, restraint is vital. You want, not too much or too litde, but just the right balance. This issue is particularly relevant to flourishes because flourishes combine a skill component with an aesthetic component. How you approach flourishes will depend on which of these elements you consider more important. If you view flourishes as primarily exhibitions of skill you'll always feel that more is better. The faster you can do the move the better. If someone else does the cut with five packets, you'll wane to do it with six. This is flourishes as athletic competition, an approach that particularly appeals to young magicians. If instead you feel, as I do, that the greatest value of flourishes is the way they aesthetically enhance your performance then you 11 strive to find the high point in the salt curve. Not too fast or too slow, not too much or too little, but simply what looks most beautiful and most enhances the overall performance. This requires both restraint and judgment. These qualities tend to come with age. (If you're lucky; for some they never come.) They're also harder to develop than the simple Tm going to take it further than the other guy did" attitude that prevails today.